Do your clients feel that people are taking them for granted - expecting them to fall in with their plans at a few moments' notice? Do they find it difficult to say "No" when they are asked a favor - even if it's something that they don't particularly want to do? If your clients come across as being too passive and compliant, others may be more likely to try to take advantage of their good nature - and the more they try to please others the more resentful they are likely to feel. This resentment can build up inside, eventually causing stress and anxiety. Your clients have a right to their opinions and beliefs, just as others have a right to theirs. As they begin to express themselves more confidently your client's self-esteem and respect will increase. 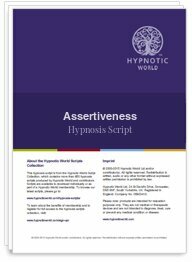 This hypnosis script can help you to help your clients become more assertive and gain the respect they deserve from others - they will also feel happier from within.